Last weekend I had some free time so I had the chance to put together a prototype room for my space corridor terrain system (along with the fantasy counterpart I'm working on). 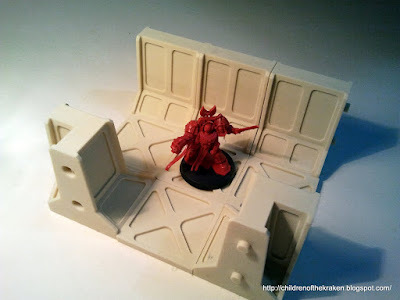 Each piece is made from the original design I had 3D printed, the room below would work for space hulk, Incursion or any other game played within some sort of tiles. I still have to figure out how many details I want to put I the room, I'll probably add some pipes using this mold from Hirst Arts but I don't want to put many things in each room otherwise I won't be able to fit some large models in the rooms. The plan is to keep adding rooms until I have enough of them to play the first scenario of space hulk, then do some playtest, add some details and paint everything... sounds like a lot of work! Fantastic work on the designs!